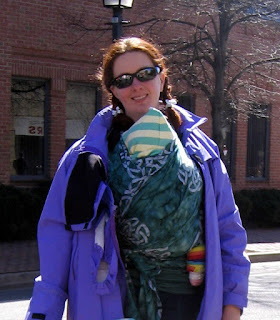 Last winter I did a post talking about Winter Babywearing, and a lot of what I talked about could apply from newborn - toddler, but today we're going to focus on those newbies. Wearing your baby leaves your hands free to hold railings when walking down potentially slippery stairs. 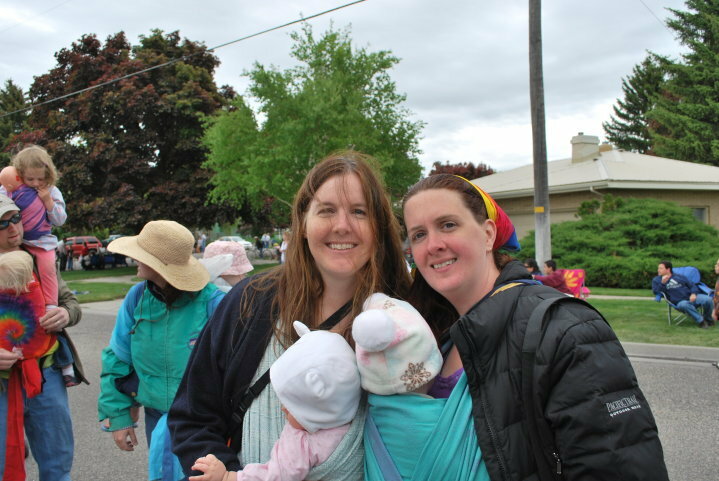 One thing to consider when wearing a newborn is what type of carrier will be a good choice? Many of the best choices for newborns in general are also great for newborns in winter. A ring sling, stretchy or woven wrap can be a great choice because they are easy to put on under your coat before leaving the house. I have had 3 winter newborns. I didn't wear all of them, but I did get a chance to try out a variety of ways for keeping newborns comfortable in the winter. None of the carseat/stroller cover/blanket combinations that I tried made me feel as confident that my baby was comfortable as babywearing did. A few general notes: Always make sure that your baby has an open airway and a path to fresh air. If it is so cold out that your baby will suffer from breathing the fresh air, it is too cold and you need to find shelter. I like to dress babies in layers. With my oldest I always put a onesie under her clothes, my second and third were warmer babies and didn't like the extra layer. I also used fleece footie jammies a lot. Babylegs (or cut off adult knees socks) over or under pants were nice because they could be removed if you were moved into an indoor location that was warm. I preferred to use my jacket instead of trying to put a jacket on baby. 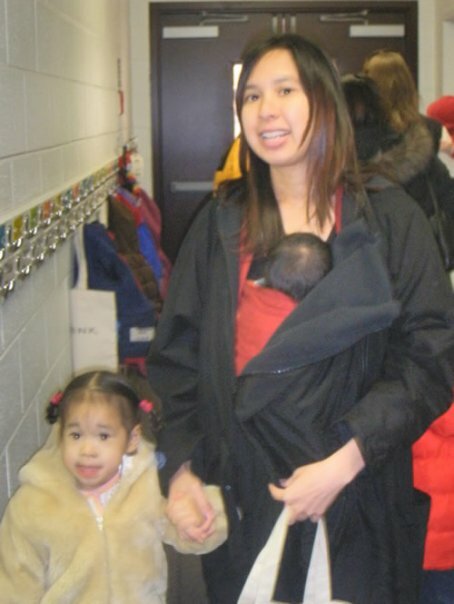 It made loading them in the sling a lot faster, and it meant they shared in my body heat. I always knew if they were too warm or too cold because we were sharing the same heat. So, if I was hot or cold, so was baby. As for how to do the carrying. I recommend putting your carrier on before you leave the house. 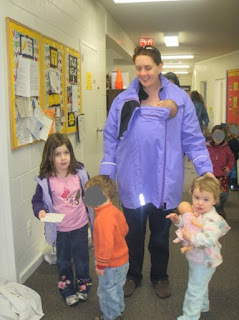 Wrap or ring sling under your coat. Then when you get to your destination, you can pop baby out of the carseat and into the carrier before they've had a chance to register the cold. With a woven wrap a FCC or kangaroo carry can be a nice poppable option. With a stretchy, the standard PWCC works fine. I do recommend a hat for your baby. It can easily be removed when you get inside and tucked in your pocket. I also recommend unzipping your jacket or removing it once inside to help prevent baby from overheating. 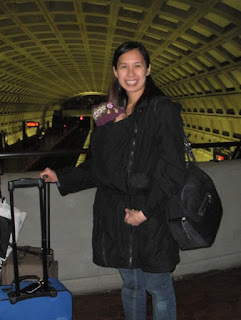 Use extreme caution if nursing in a carrier in a coat with a newborn. I did do it with my 3rd while taking the older kids to the playground, but I made sure to remain VERY aware of when the suckling slowed so that I could readjust her position. If you feel you are in a situation that you will be distracted, I recommend not nursing inside the coat. Well Nice blog and Nice post.. As winters are just to begin, I was in search of to buy baby winter dresses and I found your blog. Thanks for sharing the pictures and Ideas. It was helpful.